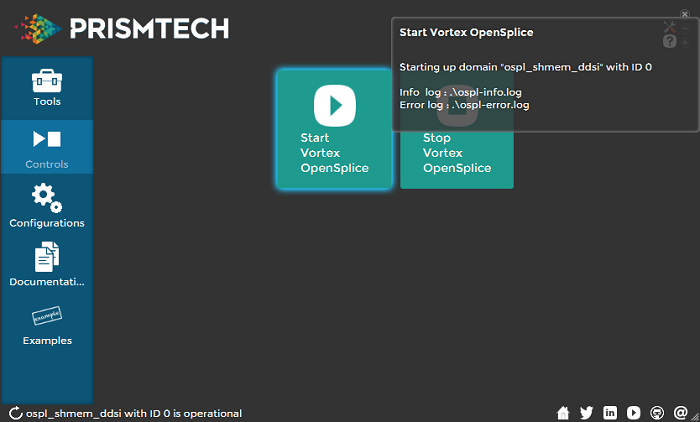 An overview of Vortex OpenSplice Launcher, how to use, configure and more. The Vortex OpenSplice Launcher guide is part of the Vortex OpenSplice documentation set. The tools tab provides easy access to all of the tools bundled with Vortex OpenSplice. The controls tab provides the ability to control and interact with Vortex OpenSplice. The control buttons are enabled if the active configuration is a shared memory deployment. Otherwise, they are disabled. 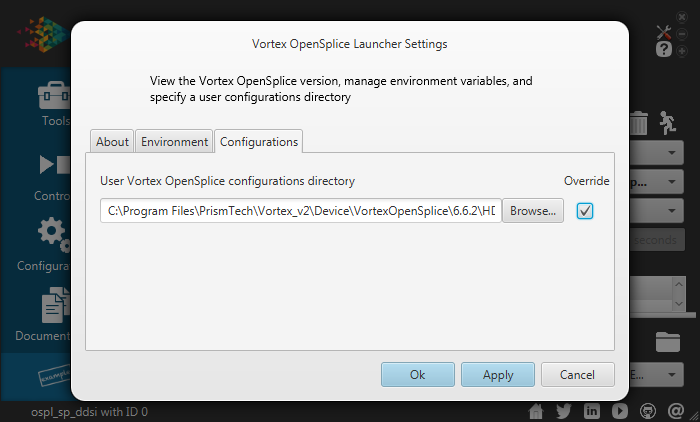 When the user clicks on the “Start Vortex OpenSplice” button, Launcher starts an instance of Vortex OpenSplice using the active configuration set in Launcher. 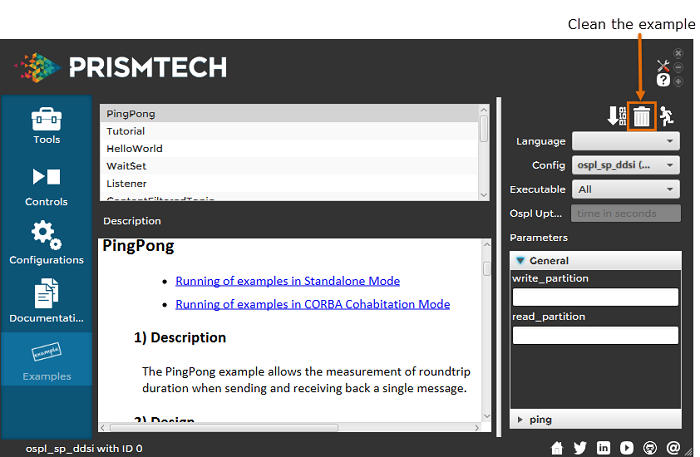 The configuration can be set in the Environment tab or in the Configurations tab. A progress bar is displayed in the bottom toolbar of the Launcher window until the execution of the command completes. Once the Launcher has completed the control’s execution, a notification popup message is displayed indicating its result. 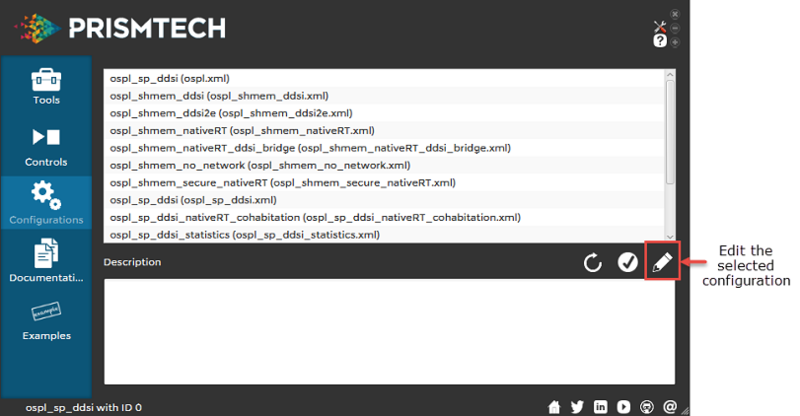 The status of the Vortex OpenSplice instance is updated in the bottom toolbar to indicate that it is running. 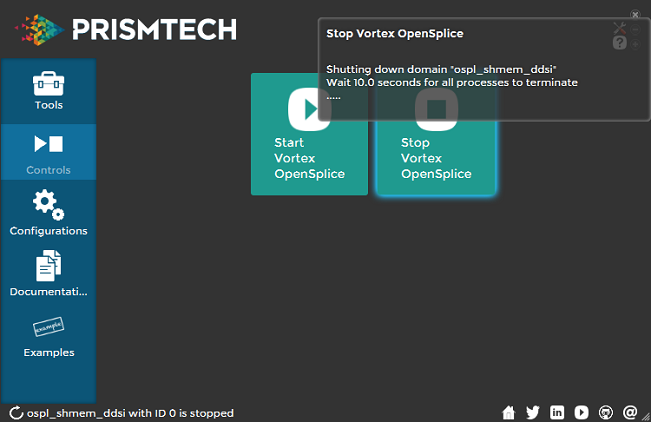 When the user clicks on the “Stop Vortex OpenSplice” button, Launcher stops the running instance of Vortex OpenSplice associated to the active configuration set in Launcher. The configuration can be set in the Environment tab or in the Configurations tab. A progress bar is displayed in the bottom toolbar of the Launcher window until the execution of the command completes. Once the Launcher has completed the control’s execution, a notification popup message is displayed indicating its result. The status of the Vortex OpenSplice instance is updated in the bottom toolbar to indicate that it has been successfully stopped. 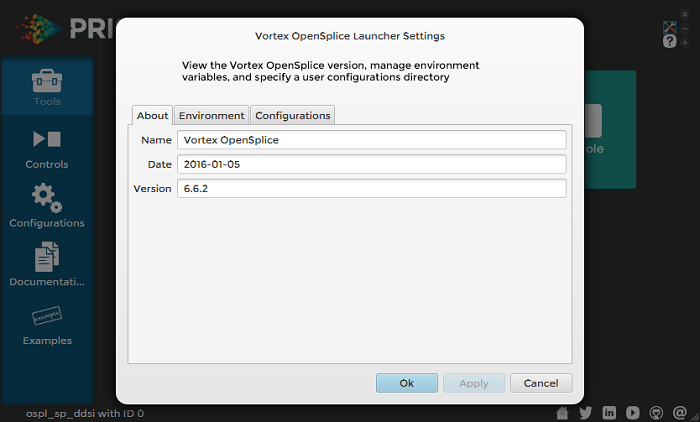 If the user tries to start another Vortex OpenSplice instance with the same active configuration, Launcher will display a notification popup message indicating that the instance is already running. If the user wants to run two instances of Vortex OpenSplice, they must have different domain names and different domain ids in order to be successfully started by Launcher. The configurations tab lists all of the configurations bundled with Vortex OpenSplice. For each configuration a brief description of the configuration is provided. Pressing the Refresh button refreshes the configurations list with the contents of OSPL_URI, OSPL_HOME\etc\config directory, and user specified configurations directory. Duplicates are removed if they exist in more than one of these locations. 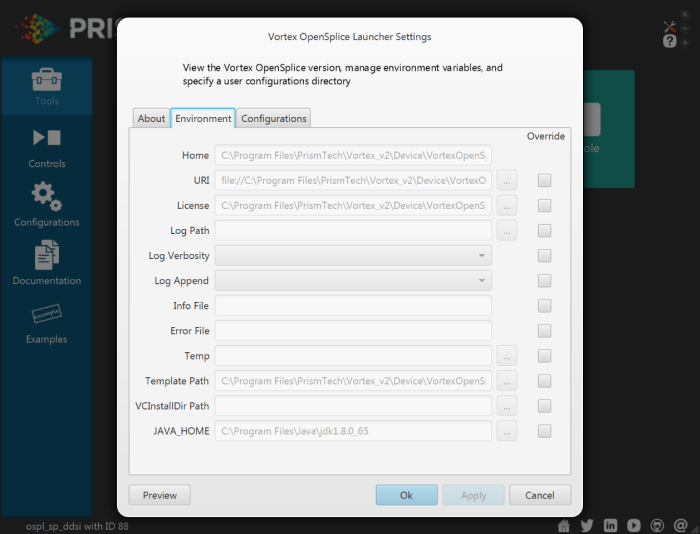 Selecting a configuration in the list and then clicking on the check mark icon will set that configuration as the default configuration used within Vortex OpenSplice Launcher. A warning is displayed if a configuration no longer exists when trying to set it as default configuration. Selecting a configuration in the list and then clicking on the icon that looks like a pencil will open Vortex OpenSplice Configurator for that configuration so that it can be edited. A warning is displayed if a configuration no longer exists when trying to set it as default configuration. found in OSPL_HOME\etc\config. The same applies to user-specified configuration directories. 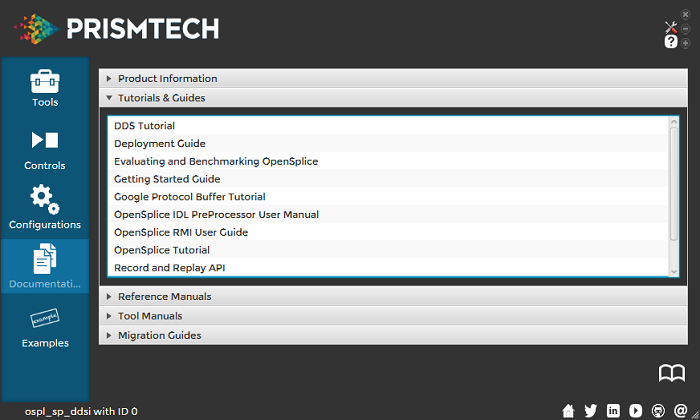 The documentation tab lists all of the documentation artifacts bundled with Vortex OpenSplice. Double clicking on a item in the list of documents will open the item with the systems default application for that type of document. It is also possible to select an item in the list and then click on the icon that looks like an open book to open the document. 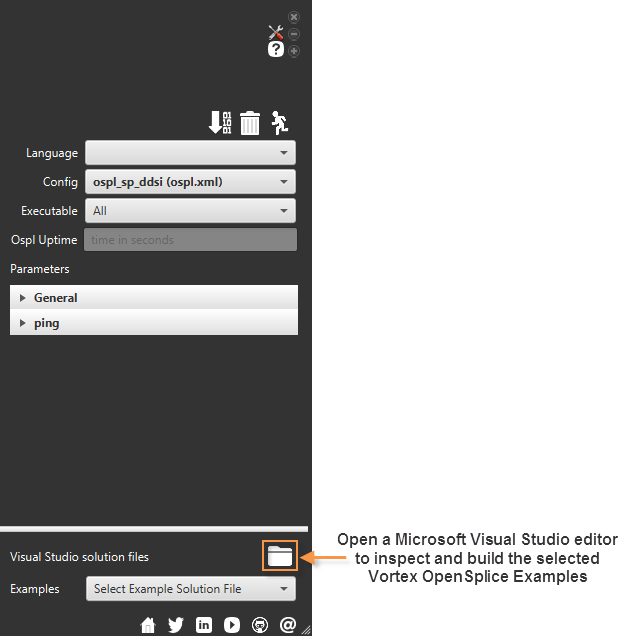 The examples tab lists some of the examples that are bundled with Vortex OpenSplice and allows a user to build and run the example. Note: If Vortex OpenSplice is installed in a write-protected directory, the application will need to be run with elevated permissions in order to build the examples. Clicking on the Build icon will compile the example for the language that is selected in the language drop-down box. A command prompt or terminal will open showing the progress and result of compiling the example. Launcher expects that the toolchain required to build the example for the chosen language are available in the environment of Launcher. For example, to build with Visual Studio this may require running vcvarsall.bat. However, the Visual Studio VCINSTALLDIR environment variable can be specified in the Environment Variables tab in the Settings pane. Compiling Java will require that JAVA_JDK_HOME\bin be found on the path. Clicking on the Clean icon will remove all the artifacts created by building the example for language that is selected in the language drop-down box. will open for each executable showing the output produced by that executable. 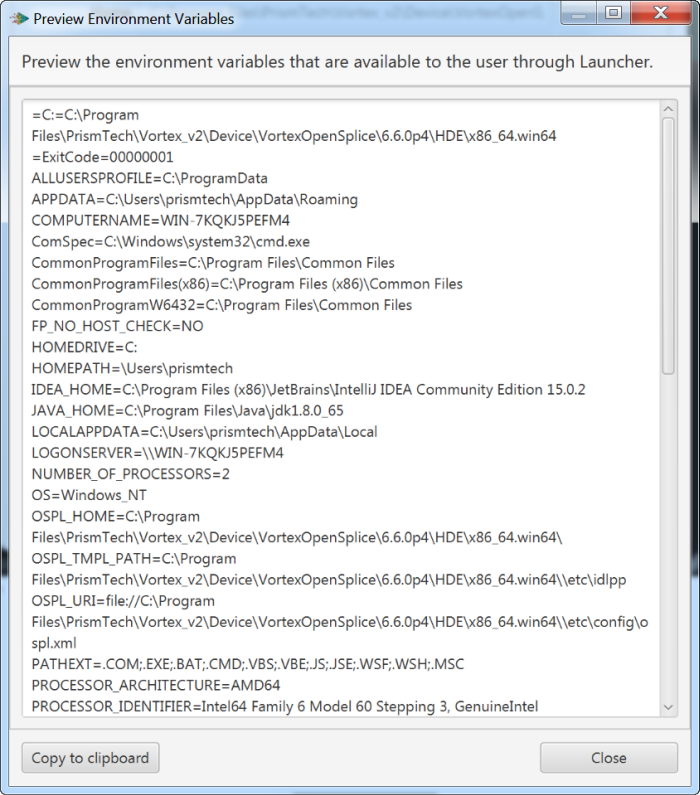 If running Java executables, JAVA_HOME is expected to be available in Launcher’s environment path. The user can select a configuration to use in the configuration drop-down box. By default, the active configuration set for Launcher will be used. 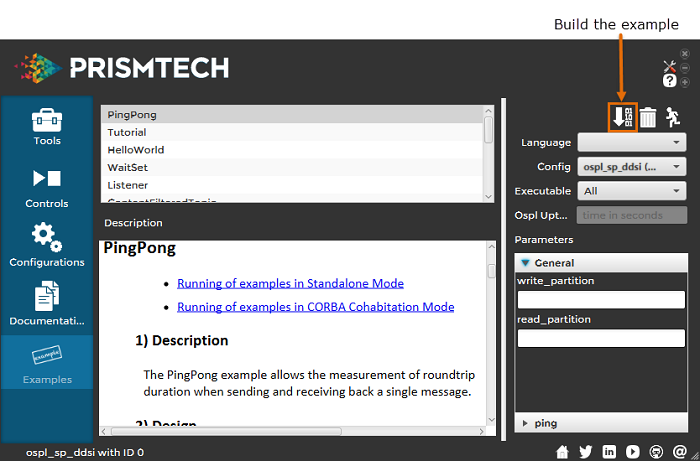 In the drop-down box, the active configuration is displayed in bold. The active configuration can be set in the Settings dialog or in the Configurations tab. 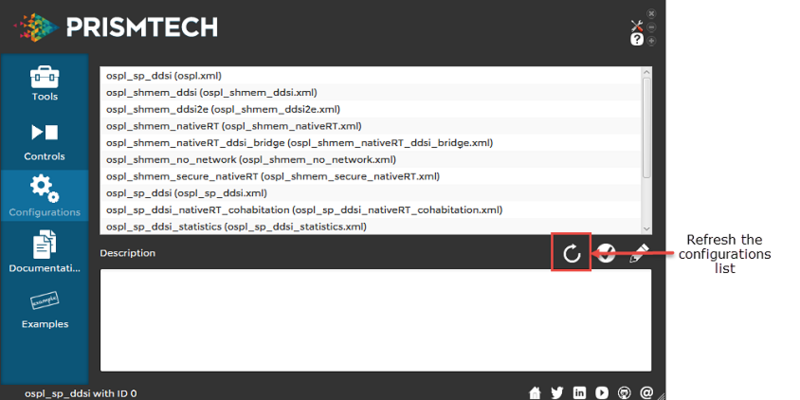 If the selected configuration uses the Vortex OpenSplice shared memory feature then Launcher will start the Vortex OpenSplice daemon before running any of the executables. of the examples across the network by using Launcher to start the executables on different computers. specified, but not shorter. If a single process configuration is selected, the field is disabled. information on what the parameter is used for. 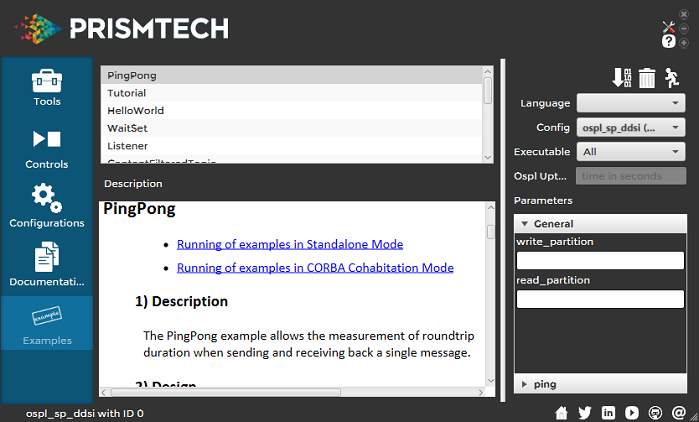 The Description section shows the documentation for the example. It is the same as the documentation you will find in each of the examples folders in your Vortex OpenSplice installation. On Microsoft Windows platforms, users have the ability to open the example solution files for the Vortex OpenSplice examples in order to inspect and build them. Prior to Vortex OpenSplice 6.6.3, these were available to users from the Start Menu in Windows. Clicking on the Open Visual Studio solution file icon will open the selected example solution file in the Microsoft Visual Studio editor. The version of Microsoft Visual Studio that is used to open the example solution files is used by either inferring from the VCINSTALLDIR environment variable or by looking in the PATH to see if devenv.exe is found. If the executable cannot be found in either locations, a notification will pop up instructing the user to set the appropriate environment variables. Setting environment variables in this tab allows the user to quickly customize their environment. 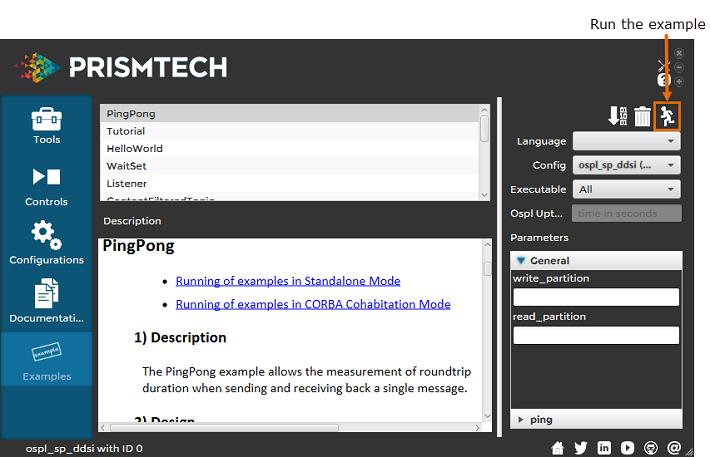 Overriding any settings will make it available to all the tools which are used by Launcher. 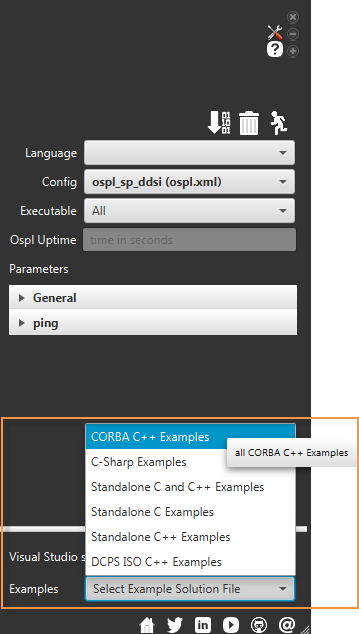 Specifying the VCINSTALLDIR allows the user to build against a specific version of Visual Studio to run the examples without having to migrate the solution files. Changes to the URI will trigger a refresh of the configurations list in the Configurations tab. To preview the environment variable settings, select the Preview button. The Preview Environment Variables dialog allows the user to view the environment variables after being modified by the user. These settings will be available to the tools and the Launcher start and stop scripts. The Copy to clipboard button copies the environment variable settings to the clipboard. Overriding the Vortex OpenSplice configurations directory allows the user to run and edit their own configurations. 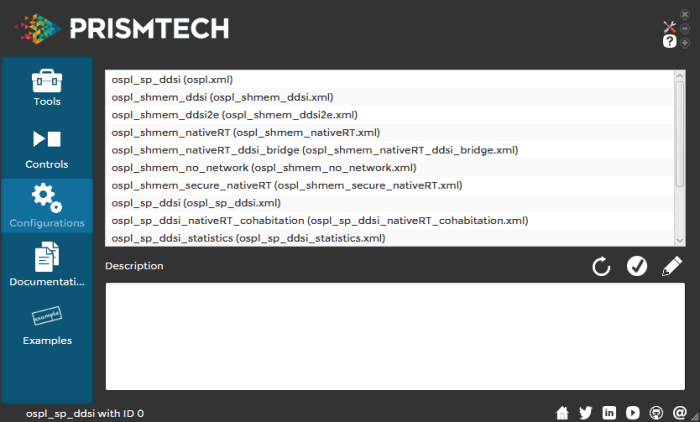 These will populate and trigger a refresh of the Configurations tab.